On Monday September 14 Northbridge Selectmen held a dog hearing to determine if the dog who mauled and killed two toy pups while boarding at Gibson Kennel in Grafton was a dangerous dog. The hearing was held at the request of Roger and Brenda Demers of Shrewsbury, the owners of the two dogs who were killed. According to Gibson Kennel the Northbridge Husky was banging her cage while boarding and was able to break out. The husky was found with the toy poodle in her mouth, according to the kennel. After a two-hour hearing the Northbridge husky was deemed a nuisance and was ordered to undergo weekly training at a kennel selected by the Northbridge ACO, the husky must be supervised around other dogs for the next thirty days. After the thirty days the board will reevaluate the restrictions. Brenda Demers held back tears while reliving the tragic event. What was supposed to be a happy trip for recent empty nesters turned into a nightmare when they learned their two toy pups were killed during their stay at Gibson. They were told their dogs were attacked by a husky who had broken loose. She said Gibson kennels said the attack happened within the first few days of their stay and the dogs were being stored in a freezer. According to Roger Demers, the owner of the kennel told him the husky had to bang on the cage real hard to get out. Photos of the frozen dogs taken by the vet after the mauling showed puncture wounds and bite marks consistent with an attack. Graham’s, the toy poodle, x-ray showed a broken spine. The veterinary report indicated it was difficult to examine the pups given their frozen positions. The owners of the female Siberian husky, Ticqua, Jane and Christopher Gentile of Northbridge don’t believe their dog could have been responsible for this and suggested another dog had attacked and killed the pups. Their attorney, Carmine Gentile, said no one witnessed the attack and the Gentiles believe the kennel could be covering for another dog. The husky is reported to have been quarantined for 45 days after the incident and is said to have no history of hostility. Ticqua was observed by professional dog trainer Bob Clark at the request of the Gentile’s attorney. Clark testified he placed Ticqua in several stressful situations and saw no sign of aggression. Clark testified some huskies are known to have a high prey drive and are known to be great escape artists, but stressed every dog is different. Michael Gibson, who was on site during the attack, was subpoenaed but failed to show. Northbridge Animal Control Office Dan Chauvin testified when he visited Ticqua during his investigation he expected to find an aggressive dog and what he found was the opposite. “The dog was yielding to anything I asked and was 100% cooperative,” said Chauvin. He testified Ticqua was not licensed at the time but was up to date on all of her shots. 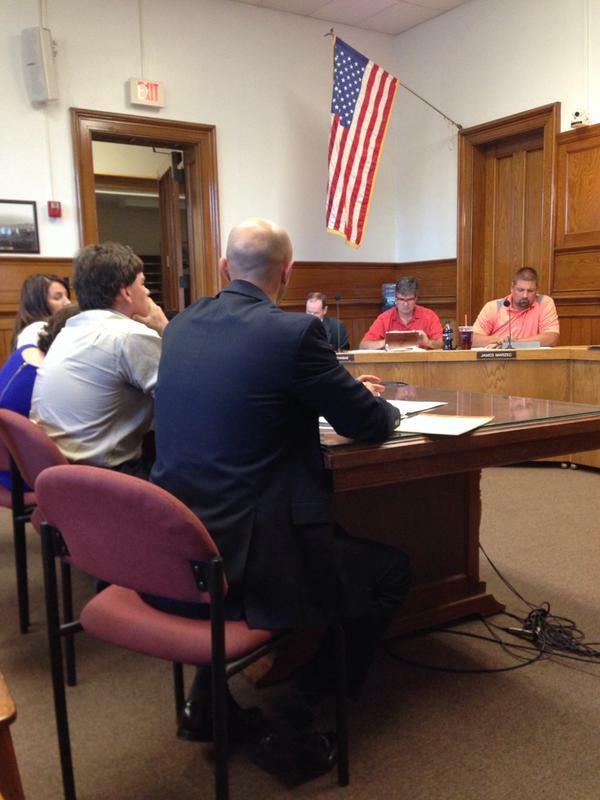 After the hearing was closed the selectmen discussed the matter. Member Daniel Nolan felt it was reasonable to place restrictions on the husky and said he was leaning towards nuisance. “Very emotional – tragic that the Poodle and Chihuahua were killed by the husky. But no one saw the attack. I would go with nuisance dog. I would like to place blame on the kennel. It is his responsibility to protect animal under his care,” said member Charles Ampagoomian, Jr. The board voted 5-0 to deem the husky a nuisance. The Demers were taken back by the demeanor of the Northbridge Animal Control Officer. “A man whose job is to protect animals considers two deaths irrelevant? He had no composure, was disrespectful, and nasty,” said Brenda Demers. “Shame on the BOS Northbridge, they did a huge disservice to their townspeople. Brenda and I will be the first ones to stand by and help the next person who has issues with this dog,” said Roger Demers. “If two small dogs were put in front of her (Ticqua) can they fully assure us it wouldn’t happen again? The town is there to protect and serve not worry about hurt feeling of someone they may know,” said Brenda Demers. “We are sickened that they admitted right there the dog wasn’t licensed but still didn’t even fine the family. We’re disgusted by the entire situation,” said Brenda. A lawsuit against Gibson’s Natural Pet Resort and the Gentiles is pending in Worcester Superior Court. Jennifer Doyle at Upton Daily follows up on the two dogs who were killed at Gibson’s in Grafton over the summer, focusing on the dangerousness hearing in Northbridge on the husky that mauled them. I’ve been following this story. What an awful thing to say that the two dogs attacked the husky. Is he serious! Also, what’s up with not following the laws the dog wasn’t licensed? That with the killings would have been the best reasons to take the dog not send it home. I’m so glad I don’t live in Northbridge they all sound like As**oles. Not a dangerous dog, it killed two!! What else would that equal? I can’t wait to watch the meeting online as they are taped for the public. Or will they pull it because they did such an awful job? By the way covering for another dog. Really grasping now. If the family always brought their husky their why would they do such a thing to them? Those poor babies.